Players of Bashundhara Kings and Arambagh Krira Chakra sprint during their Bangladesh Premier League match at Sheikh Kamal Stadium in Nilphamari on Sunday. Bashundhara won 3-2. 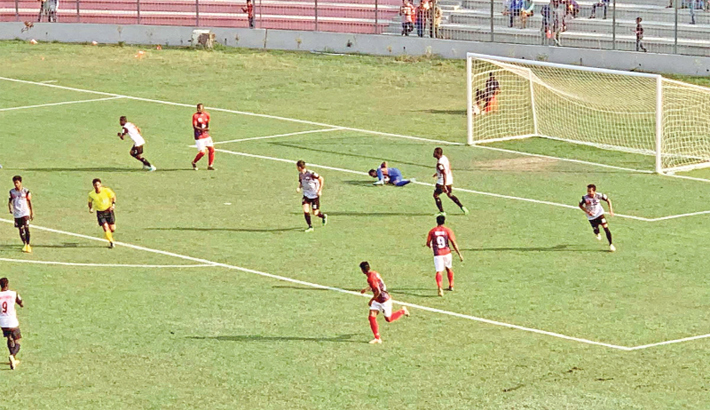 The raging Bashundhara Kings won their way into the apex of Bangladesh Premier League charts thrashing Arambagh Krira Chakra by 3-2 goals at their home turf at Sheikh Kamal Stadium in Nilphamari on Sunday. Bashundhara Kings looked all set to return back to momentum following a draw against a lowly Team BJMC in their previous match. The urge to see themselves on the top of the table replacing their arch rivals Dhaka Abahani must have been on the top of their agenda as Abahani are now standing in at second spot with 18 points from 8 matches while the Bashundhara Kings assumed the top-spot with 19 points to their name that too from only 7 matches. But the absence of Bashundhara ace defender Nasir Uddin Chowdhury took a toll on the overall defence apparatus as the defender was shown a red card during their previous league game against Team BJMC. Aramabagh local forward Arifur Rahman utilised a lapse in Kings’ defence to place the ball in the nets from a cross by their overseas recruit Chinedu Mathew on the 23rd minute. But Bashundhara Kings came back in stunning fashion as men in red restored parity courtesy of an own goal by Arambagh forward Zahirul Islam Babu. Local players continued to shine throughout as Kings forward Motin Miah flaunted his skill as he gave Bashundhara Kings the lead on the 32nd minute. Motin smashed a left-footer into the nets after receiving a long pass from Bashundhara Kings World Cupper Daniel Colindres as he managed to elude the off-side trap. Kings continued to wreak havoc as Bashundhara Brazilian Magician Marcos Vinicius headed a short cross from Alamgir Kabir Rana into the post to take the scoreline to 3-1. Bashundhara Kings started off second half with their characteristic zeal but couldn’t held on to it long enough as Aramabagh threatened to take the game to Kings as Arambagh forward Kingsley Chigozie reduced the gap of score-line with smashing shot from the edge of the D-box off a head from Chinedu. Arambagh in their attempt to stem the flow tried their fate with going to the offence without much luck. On the 88th minute of the match, Ikbol Babakhanov missed a cake of an opportunity as he blasted a freekick from danger-zone into the gallery. On the final minutes of the match, Bashundhara prized recruit Colindres was about to hammered the final keel on Arambagh’s coffin as Colindres dribbled across from left to right in the D-box and found a 1:1 with the goalie but could not thrust a swinging ball into the post. Arambagh claimed victory against NoFeL Sporting Club in their previous BPL match. On the other match of the day, Muktijoddha Sangshad Krira Chakra took apart Team BJMC by 2-0 goals at Sheikh Fazlul Hoque Moni Stadium in Gopalganj. Mehedi Hasan Royal and Mithun Biswas scored for Mukti to hand them the elusive victory. Muktijoddha have amassed 10 points from 3 wins and a draw while Team BJMC are still stuck with just 3 points so far in the league. BJMC played 8 matches so far in the tournament and have conceded 5 defeats.